Are you feeling drawn towards Meditation? Meditation has many benefits. I can help you by teaching you different kinds of meditation and the basics of meditation and you can choose what works for you. 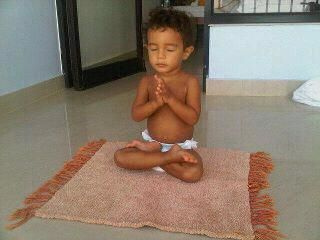 To meditate is to turn inwards, to concentrate on the inner self. Silent Meditation: It helps us to become a witness to our thoughts. First remove all the things that might distract you from your meditation and create a quiet place where there will be no disturbances. Decide how long your meditation should be. It can be fifteen minutes, an hour, even five minutes. If you need to, set an alarm. Most people, once they become comfortable with meditation, can tell the amount of time they’ve been meditating by how they feel. Once you’ve done this, settle into a comfortable position. Thoughts arise spontaneously in the mind. They are a natural part of meditation. The goal of meditation is to become more at ease, relaxed and at peace with whatever is happening. Therefore, it is important to not resist anything that comes in meditation, including thoughts. Don’t try to push out thoughts or resist them. Simply notice that thoughts are present and let them go the way they come — effortlessly. When you find that the awareness has been caught up in a train of thought, easily come back to the present and the focus of your meditation. Mantra Meditation: A meditation mantra is a sound that is has a very beneficial effect on your body, mind and soul. Using one helps to calm the chatter of your mind, activating the feeling of harmony that the mantra infuses in you.The mantra aligns itself with your own personal vibration as you repeat the particular sound or phrase. Ripples are set up that spread through your being, connecting you to your spiritual essence. Sounds were and are used to heal people physically, spiritually or energetically in ancient traditions, because the sounds vibrate higher, tap into a persons consciousness and align it with their higher selves, actually changing their consciousness. 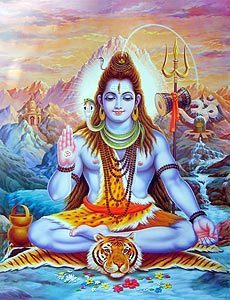 A common Hindu mantra is "Aum Namah Shivaya" relating to Shiva. That's Shiva on the right. This is a popular mantra in Hinduism and particularly in Shaivism. It is known as the great redeeming mantra and the translation is "adoration to Shiva", preceded by the mystical syllable "Aum". Or it could be translated as "I bow to Shiva". Shiva is the supreme reality, the inner Self. It is the name given to consciousness that dwells in all. Shiva is the name of your true identity, your Self. Or from Tibetan Buddhism the mantra "Om Mani Padme Hum". Tibetan Buddhists believe that saying this mantra (prayer) out loud or silently to oneself, invokes the powerful benevolent attention and blessings of Chenrezig, the embodiment of compassion. Breath Meditation: At its simplest, you find a quiet place where you won't be disturbed. Breathe in a long, slow, deep breath. If possible hold it for a second or two before releasing it, again slowly. Repeat this over again, at least 5 times and ideally more. You'll find that this is a quick way to bring about a more relaxed state in your body. Bring your awareness to the natural flow of the breath, noticing the details of the sensation of breathing. When the attention wanders, it is gently brought back to the breath. Chakra Meditation, Balancing and Cleansing: Chakra is a Sanskrit word meaning "spinning wheel of energy". The Chakras are the dynamic conduits of Life, connecting you directly to the Universal Life Force. 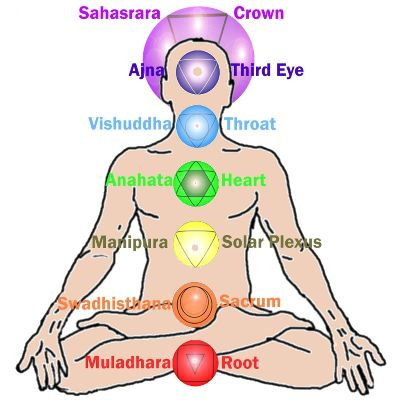 There are seven major chakras running along the spine, and each chakra is situated at a major endocrine gland, and nerve bundle within the physical body, called a plexus. Each chakra is related to a different color and is connected and associated with different parts of the body. Through meditation and balancing, you can more easily achieve a healthier balance of your body, mind and spirit. Guided Meditation: This can be guided imagery where someone describes a scene for you and you follow along, building the images and sensations in your mind. Or it can be done with the individual picking a particular relaxing or desirably peaceful location. Once your meditation time is up, spend a few minutes focusing on the experience, what you discovered or questions that arose. 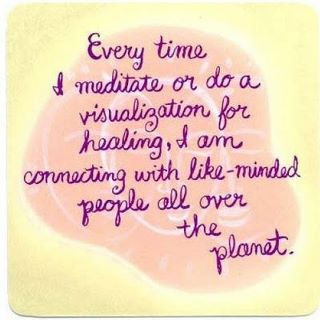 Sometimes it is good with any of the ways of meditating to keep a journal of your experiences and use those during other meditations to bring greater insight into yourself and create a whole picture of a given topic or focus. Guided meditations usually last between 20 and 60 minutes. Typically a guided meditation will start with a relaxation procedure so that you're relaxed and receptive for the main part of the meditation. It will then move on to the actual aim of the meditation, whether this is deep relaxation, healing your body, contacting your higher self or any other goal you have chosen. Compassion Exercise: Some people like structure. A nice meditation for people who want a technique is a compassion or loving-kindness meditation. First, you call to mind your own self and say silently “May I be happy, may I be peaceful, may I be healthy, may I be free.” Next, call to mind someone you love, and say the same, but replace the Is with yous, obviously. Next, call to mind someone who you are having challenges with and do it for them. From there, you can extend this meditation out to the entire world (“may all people/beings everywhere be happy” etc.). Walking meditation: This is one of the ways to meditate that brings awareness to sensations and experiences. Instead of focusing on a thought, focus on how each step feels, concentrate on your body, each move your muscles make as you take a step. The purpose of this type of mediation is to focus on the sensation and experience of walking itself. You can focus on your breathing and count out your breaths while walking. Just break your steps down into slow, mindful movements and breathe. You may repeat a favorite inspirational verse or affirmation. Notice how the ground rises up to meet your feet. Walk with 'soft vision, allowing the eyes to relax and focus upon nothing, while aware of everything. Once you have discovered your natural rhythm, lock into it, so that the rhythm of the walking sets the rhythm for the breath like a metronome." 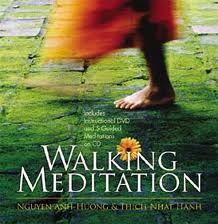 Walking meditations are employed in various meditative traditions.